2018 was my first full year of garment sewing (I started in the fall of 2017). Like many beginners, I started with quilting cotton and patterns for boxy woven tops. With encouragement from Craftsy classes and reading lots of blogs, I progressed to knits, bought a serger, made a coat. 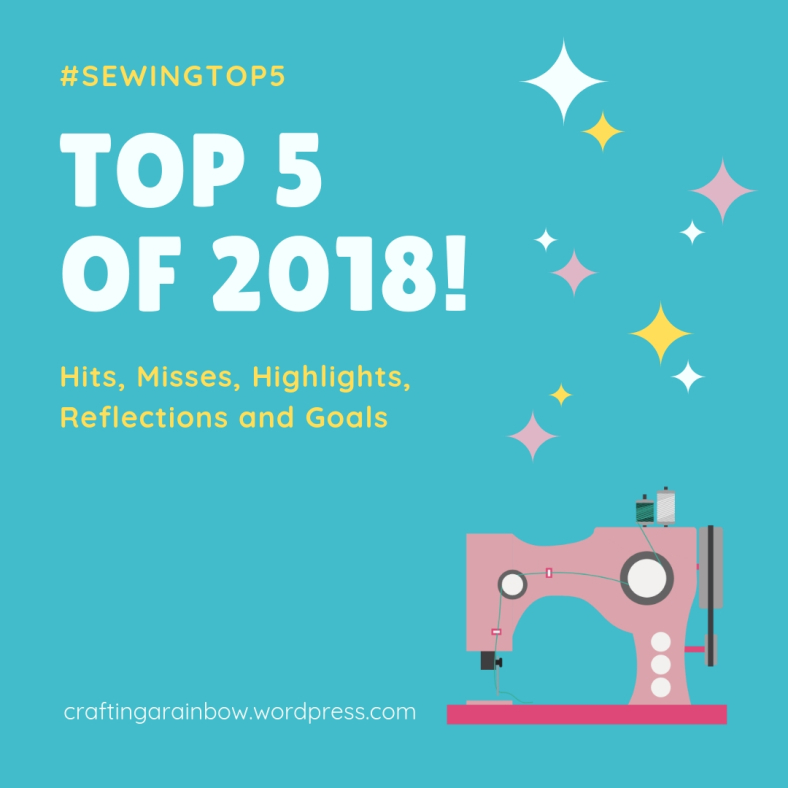 So I thought it would be fun to join in the #SewingTop5 blog series hosted by Gillian from Crafting a Rainbow where she encourages sewing bloggers to post about their highlights (and lowlights) for 2018. Here’s my top 5. I like to cook. I like finding new recipes and new techniques. But I don’t alter them — even ones I’ve made for years. If I want to recreate a dish I’ve eaten at a restaurant, I look for a recipe that’s close, and if nothing turns up, I go on to the next thing. So when I started sewing and immediately started pattern hacking, I was pretty surprised to see this new side of myself. For instance Marilla Walker’s Maya top — I’ve color blocked it, made it in different fabrics, altered the neckline, altered the front into a tulip shape… I’ve done the same thing with a skirt pattern. 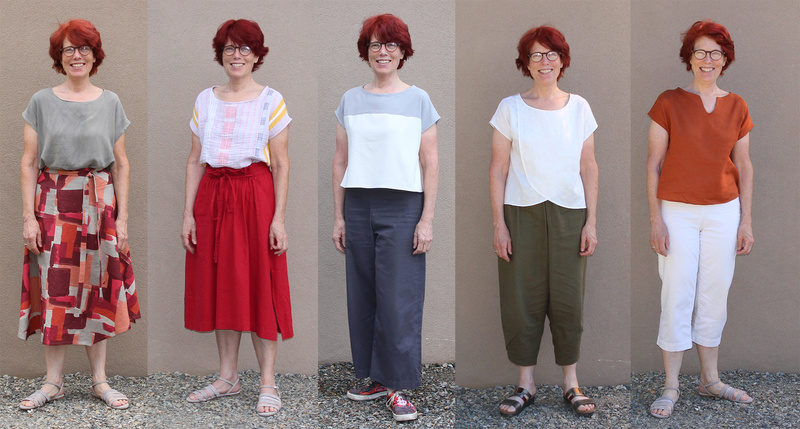 My mayas: (left to right) original in rayon (no alterations), made from a cotton dress that fell apart, color-blocked with silk noil, tulip hem in a double gauze, “madewell” neckline in linen (from a Grainline Studio pattern hack). One of my first makes in 2017 was a Shirt No 1 for my Mom. It was October, and she loved cats and holidays, so I choose a fall/Halloween themed quilting cotton. I made another one for Christmas. When my Mom passed away last February, my sister was tasked with sorting through all her clothes. Imagine my surprise and pleasure this past October when my sis sent me a photo of her in the Halloween shirt — she’d saved both my makes to wear for herself. 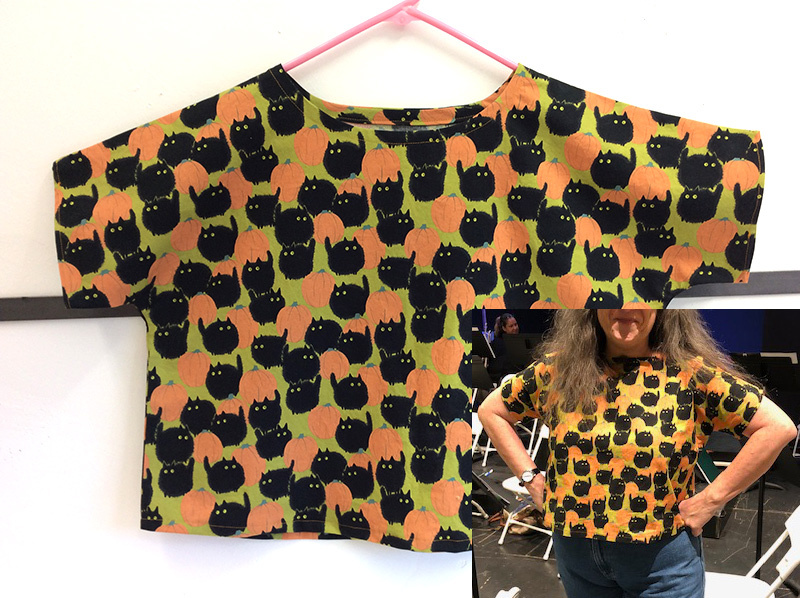 I was also surprised that within 6 months of starting to sew I had enough tops (and a few other things) to wear a me-made garment every day of May without too many repeats. And even more proud of myself for getting a photo every day (although I should thank my husband, who took the photos and reminded me on the days I forgot!) You can see the recap here. My husband has teased me for years that I wear only solids in black, navy and dark brown. Sewing has changed that. 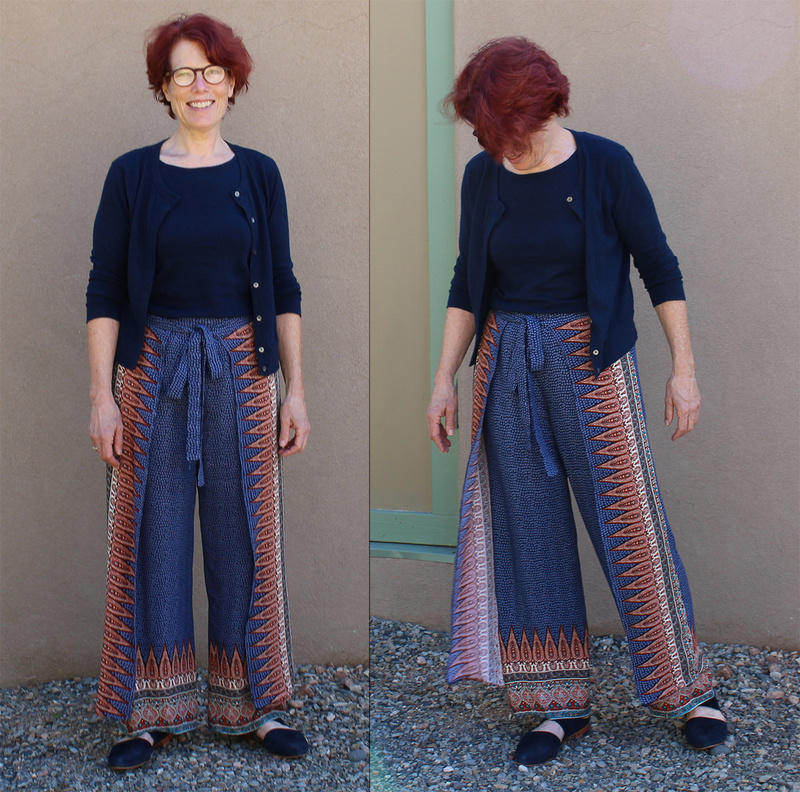 I never would have predicted in January that I’d make these pants and wear them outside the house (and more than once at that)! I’ve had wadders and patterns I couldn’t figure out how to fit, I made a lovely blouse only to spill cooking oil down the front the first time I wore it, I tried unsuccessfully to make slim fitted flat front pants (3 times, actually), but I had to think hard to remember the failures. Mostly I’m left with the pleasure of dreaming up a garment, finding the pattern, sewing it up and wearing it.